TCM Alert: Spend Next Thursday With Lesley Selander. | 50 Westerns From The 50s. 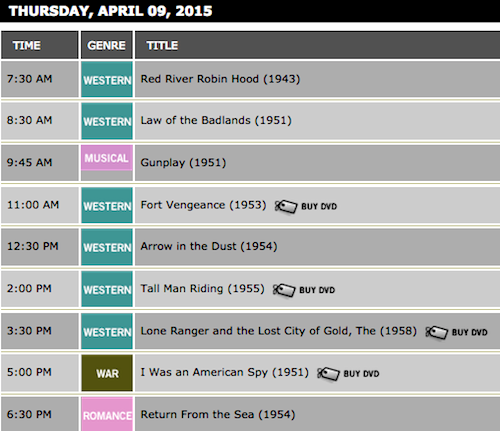 « 50s Westerns DVD News #177: April From Warner Archive. Isn’t it great to see Les Selander receiving some well-deserved recognition. We all know his tremendous value to the western and it’s nice that the word is spreading. Nice one for Tim Holt Tuesday, Toby! Too bad TCM didn’t put on 3 Tim Holts that have NOT already been released. Guess they’re not dumb. But Fort Vengeance is worth a special note. By the way, watching Laramie every week as I’ve been doing for a while now, I notice Selander is practically a regular director for most all of that series. I wouldn’t mind seeing a couple Laramie Selander episodes either. I just ordered CONVICT STAGE from 1965 directed by Selander .I’ve never seen it before but watched a bit of it on U Tube and it looks ok.
I’m clearing the decks and will brook no interruptions. It’s going to be Mommy’s day! Westerns from the mid-Sixties produced by Hal Klein. was lack of star power. STAGE. Apart from that it’s filmed with Selander’s usual flourish. mileage left in low budget black and white Westerns…..there wasn’t. three so I wonder if Mr Schenck had any involvement in them. habit of losing “epic” threads. gave Selander regular employment during the Fifties. Note to Kino Lorber….Blu Ray needed..pretty please! associate of Frank Sinatra and then head of production at Paramount. Normally Hal Klein served as producer on these films. Schenck productions,so there was some sort of connection there. I cannot seem to find the link to the full list of these TCM Selander Westerns. release is a lovely transfer. I adore these Monogram/Allied Artists 70 minute Cinecolor Westerns. another Selander Western that I like a lot. announced a whole new raft of Republic Westerns. was hoping was one of the Allied Artists titles owned by Warner Archive. those AA titles now owned by Republic. by now especially considering the latest Allied Artists wave of releases. 1.85 as opposed to 2.35. Horrible off air copies of this one do exist but not in watchable quality. releasing English versions of these great Republic Westerns. John K, where do you find westerns in Fernsjuwelen site? I found THE LAST COMMAND at Amazon De as a pre order which I would like to get ,even though I’ve never seen it .Have you seen Selander’s last movie ,ARIZONA BUSHWACKERS with John Ireland .I just bought THE BUSHWACKERS also with John Ireland and Dorothy Malone. I always check out the Fernsjuwelen releases on the Alive AG website. the various imprints that they handle. so wait nearer the time before ordering. on Alive AG but this may not be correct. seems to have a German only soundtrack. of finding out if they hold the rights to THE TALL STRANGER. a break from time to time. and Allied Artists Westerns I just cannot restrain myself. As soon as you verify that The Last Command is in English let me know. It was one of my mom’s favorites and I really want a nice copy of it. case before I started joining in the fun. are on board so that’s great. The fact that we now have TCM Selander fests is wonderful. Thanks,Toby BTW for publishing the full list. It’s certainly the starkest,most adult Bill Elliott Western ever made. I highly recommend that Colin gives it a try. were available on DVD Colin would in fact get most of them. The problem is none of these films are available and they should be. with a German only soundtrack. The bottom line is,the more cyberspace attention these great films get. the more chance we have seeing them get released. wouldn’t that be really something! The Showdown is terrific. One of the best opening sequences in all 50s Westerns — you know you’re in for something different. Thanks for pointing out my Selander “evangelism.” It’s so good to see his stuff getting more attention. Santa Fe Passage will be on GRITTV , Tuesday April 7th at 6-8 P.M. EST. Even if WOMAN OF THE NORTH COUNTRY is only in German, it will at least be in color, presumably. .
You know, from signs I’ve seen from Warner Archive and seeing what’s showing up on TV stations like GRIT and GET, I have a feeling there will be a Warner Archive release of Bill Elliott movie & one I am almost sure will be included will be “Showdown”. 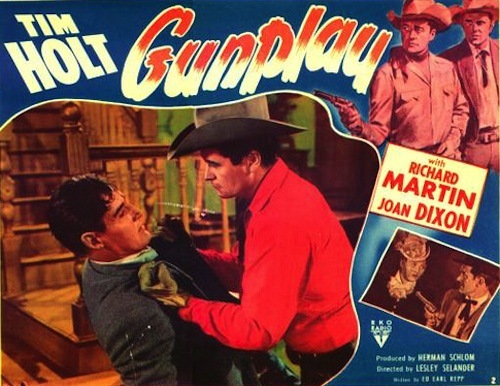 Why, Grit TV has in recent months already showed “Showdown” a few times, Warner Archive says they’re working on a Elliott release, Add it up, one of those movies in the Warner release is bound to be “Showdown” as it seems to have already been cleaned up and ready for prime time. Woman of The North Country, Brimstone, ARIZONA BUSHWACKERS, THE BUSHWACKERS & Last Command are all movies in my collection, I wanted them for various reasons, Gale Storm & Rod Cameron for 2. But I would love to get a commercial US release of these anytime. Hopefully some video company will wake up to the need out there. THE LAST COMMAND (1955) and SANTA FE PASSAGE (1955) were released in the 1.66: 1 ratio, so full screen versions might not be all that bad if the picture quality is good—much better than panning and scanning something that was originally 2.35:1 or 2.55: 1. Meant to say a future release from Warner of Bill Elliott MOVIES, not movie. Showdown is the only one that I have seen that will be included in that Elliott set of movies. The Showdown was Elliott’s last Republic picture, so it wouldn’t be part of a Warner Archive set. There’s been an extreme dearth of classic ’50’s westerns for the past several months on Grit TV, replaced with “modern action” movies with stars I could care less about. If it’s not Charles Bronson or Clint Eastwood (as far as modern stars go) I’m not interested anymore in action movies of today. Wow, now that’s a lineup! Wow, that’s quite a lineup. get English language versions of these films. will report here regarding picture quality. attractively packaged with very nice artwork. films;I would have thought they would have been right up VCI’s street. John K .I did have THE LAST COMMAND on order but decided to cancel it and reorder it when it gets close to the release date .I wish we didn’t have to wait so long but it will be worth it as they have nice art work etc. I love the cardboard slips they put on some of these DVDs ,usually on the first releases and I just ordered THE SECRET OF CONVICT LAKE from a UK seller who does not ship to Australia and had it sent to my relation in the UK so he could send it to me . Always the way ,every other seller did not have one with a cardboard slip from Amazon DE,FR,IT and ES .Crazy huh!!! 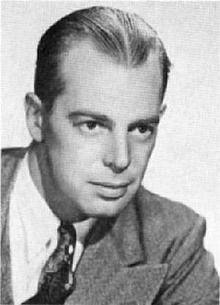 I think that photo of Leslie Selander has an uncanny resemblance to Raymond Massey in his prime. Does anyone agree? and it seems with an English soundtrack. on UK TV is horrible. Rhonda Fleming and James Griffith is still an offer I cannot refuse. and nice sturdy slipcases and lots of trailers as extras. it’s noted as being in English. and its high on my “most wanted” list. It it turns out it is in English then that’s wonderful. extras go on their DVD and Blu-Ray releases. SEVEN which was shot in Spain. Warner Archive Facebook page and they say…stay tuned! sold out already…and that’s even before it’s been officially released!!! The Filmjuwelen release of AT GUNPOINT (1955) is now described as German language only on Amazon.de. whereas it originally was said to include an English track. So, they have yet to release any of these westerns in English. Since THE ETERNAL SEA (1955) features an English track, maybe there’s still hope. I have the Spanish copy of BULLWHIP to which you refer. It was released by Suevi’a and is in 16/9 (2:35) ratio. You probably understand these ratio measurements better than I.
John K ,thanks for the info on BULLWHIP ,GUNS FOR SAN SEBASTIAN and RIDE THE MAN DOWN .I think I may have emailed WB to see if they owned SAN SEBASTIAN but received no reply .Definitely looking forward to these. TO DENVER to their ever increasing roster of Republic goodies. And guess what……it’s in German only. Olive Films especially his Republic and Paramount Westerns. really makes me incredibly sad. Perhaps the only solution is to go to night school and learn German. I tend to avoid Suevia product due to quality issues with that imprint. My most recent order from Amazon.de included the Studio Canal/Art Haus blu ray of DIE BRUCKE (THE BRIDGE). The Amazon.de website says (still to this day) that it contains an English as well as a German language track. However, the back of the blu ray case clearly states that everything is in Deutsch only. Fortunately, Amazon is really good about handling complaints, and they removed the charge and shipping for that title from my credit card. Odd that they haven’t corrected the product description on their site. Criterion has since announced that it will be releasing THE BRIDGE on blu ray, but I don’t expect them to be releasing SANTA FE PASSAGE or ROAD TO DENVER any time soon. they are ALL in German only. clunker,but hey the good far outweigs the bad. DAKOTA INCIDENT is the least of his Westerns. turn crooner Vaughn Monroe inrto a Western star. by the reliable R.G.Springsteen it should be worth a look. ANYTHING with Ella Raines I say! a big budget and a knockout supporting cast. in its original 1.85 widescreen ratio. Now we get to the cream of the crop! A Joe Kane Rod Cameron Western that I have never seen. continued to film their programmers in widescreen Naturama. This one according to Alive AG is presented in its original 2.35 ratio. made for Allied Artists. Presented in its original 2.35 ratio. seems to care. I hope this is not the case! REPUBLIC WESTERNS RELEASED IN AMERICA!!!!!!!!!!!!!!!!!!! that he rightly deserves but what about Joseph Kane. they more or less hit the ground running with Allied Artists Westerns. Someone at The Archive obviously loves ’em. released with a German only soundtrack. Joe Kane is someone I’d love to really dig into, but his 50s films are so hard to find — as your comments about Republic being so absent from DVD illustrate. I’m very familiar with Kane’s Autry and Rogers stuff, etc. — but many of the later films, such as Thunder Over Arizona (1956) and Gunfire At Indian Gap (1957, shot in B&W Scope by Jack Marta! ), I’m dying to see. Olive Films had the chance to bring some Republics out in the US, dipped their toe in the water and stopped. Luckily, some of those are still making their way out — Stranger At My Door, for instance. I don’t see many more coming after those. Speaking of Olive, my copy of The Quiet Gun arrived. Can’t wait! they are always in 4×3 pan & scan not 2.35 Naturama. TWICE in black & white Naturama. more to him than that. with all that lovely poster artwork reproduced,i’d certainly get the lot! You already know you can add my name to the request for these rare titles to be issued with English soundtracks by SOMEONE. The films you list above, John, are all worthy of release and I also would want all (or most at least).